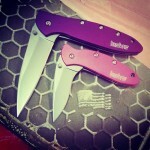 This Kershaw Chive, 1600PINK, has a pink handle made from the same light weight anodized aluminum as the other kershaw chives. Can't think of what to get her? This knife makes a nice novelty for your lady's purse. Made in the USA.